Galbanum has been used in healing and in incense for thousands of years and there are references to it found in the Old Testament as well in ancient papyri. The Egyptians imported mass quantities from Persia to use in their religious ceremonies, in embalming and as a therapeutic healing aid. 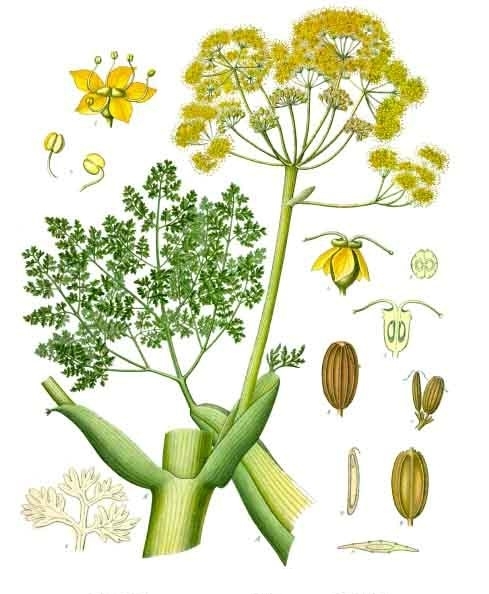 Galbanum is steam distilled from the gummy resin of the ferula galbaniflua plant. A thick cut is made at the base of the plant and the resin oozes out, is caught and then processed into an essential oil. The smell of galbanum is heady, woody and green. Galbanum is a wonderful oil to use for calming and balancing the psyche. It harmonizes, centers and brings one into inner focus. It can also help reduce nervous tension, stress and emotional upset. Known to relieve anger and depression, galbanum also aids in dispelling irritability, hysteria, paranoia and general malaise. Considered an aphrodisiac by the ancients, this soothing oil relaxes the nervous system reducing emotional rigidity and releasing energy for more creative purposes. Its balancing effect on the pineal gland makes it an ideal oil for use in meditation and deep spiritual work. Used in skin care, galbanum works wonders on aging skin, wrinkles, acne and scar tissue. Being antiseptic and antimicrobial, wounds are more quickly healed, as are boils, abscesses and ulcers. It has soothing properties, especially on aching hands, feet or joints. Its anti-inflammatory qualities make it a wonderful aid for rheumatism and poor circulation and when used in hot compresses it works well for most pain relief. Considered a woman’s oil, galbanum is great for menstrual problems, PMS, cramping and bloating. It is said to strengthen the female reproductive organs and balance the hormones. Used in ritual, this is a powerful oil to connect a woman to her moon cycles on a spiritual level and harmonize her to the earth energies. It is a yin oil that supports the grounding of the sacral energies. I have found that galbanum’s frequency is resonant with that of the feminine side of the St Germaine energies. In aromatherapy, some of the essential oils carry a Master level energy and because St Germaine encapsulates both the feminine and masculine principles, galbanum is the yin to frankincense’s yang, both being in the St Germaine frequency. Galbanum brings the solar plexus “I Am” energy into the sacrum where women hold their seat of power, therefore strengthening self-empowerment and self-actualization, whilst harmonizing and balancing the masculine and feminine polarities. It truly is a divine oil, which carries the Light of the purple flame. It is said that St Germaine will lead us into the Aquarian Age and we can all make the transition easier by burning galbanum and/or frankincense in an aroma lamp to support these new energies.